With less than an hour to go before Norwegian Breakaway sets sail on our seven-day cruise to the Bahamas, we are stop-go racing across the streets of New York in a taxi. 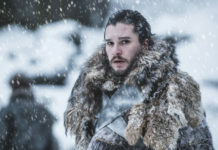 My fingernails are pressed into my palms and a stress headache is drilling into my brain, fighting the murderous thoughts about my offspring already loitering there. Rewind an hour and we’re checking in at the Manhattan Terminal when Charlie, 16, discovers he has left his backpack at the hotel. The Norwegian Cruise Line crew are unflustered and leap into action, arranging a cab and phoning ahead to warn the hotel to expect us. Nothing is too much trouble. Bag retrieved, we rush back to the port to rousing cheers from the staff. I love this cruise line already and we’ve yet to set foot on a ship. Happily, check-in is fast and efficient and we’re soon on deck, glass of fizz in hand (me), nose pressed against the glass (him), watching in awe as we sail past the Statue of Liberty and out into the sparkling waters of the Atlantic. We’re discovering that Norwegians do things a little differently, from the splashy mural of New York that decorates the hull of Breakaway, to the modern luxe design of the interior. There’s no stuffiness and staff are fun, friendly and welcoming. It’s all part of Norwegian’s ‘freestyle cruising’ philosophy, which is reflected in the lack of formal evenings on board and set dining times. 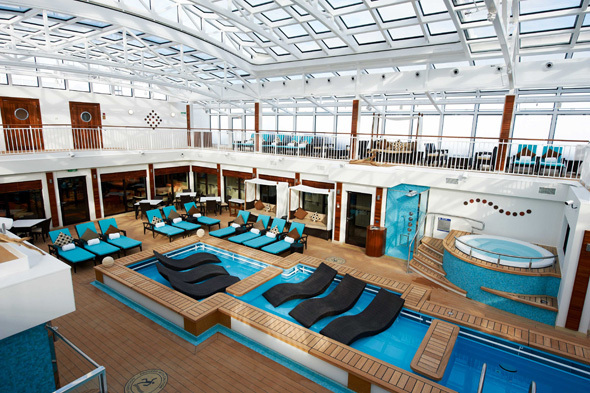 Launched last year, Norwegian Breakaway offers multiple restaurants, a casino, art gallery, jazz club, theatre, the very popular ice bar, comedy club, cafés, shops, an atrium with a huge indoor screen and more bars than you can shake a cocktail stick at, all spread out over 16 decks. 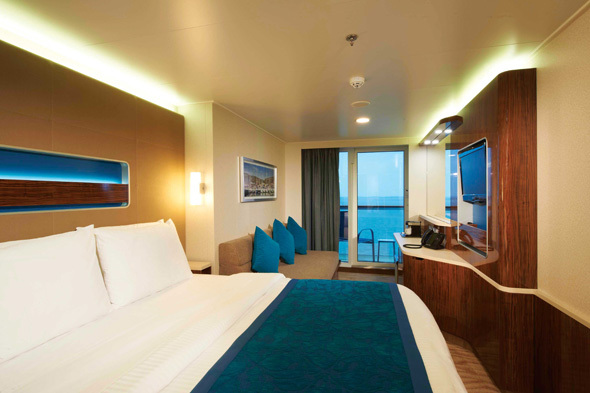 Our stateroom is bright and sleek with lots of shiny wood, texture and flashes of colour. There is good use of space, loads of storage, a clean, modern bathroom with a step-in shower, comfy twin beds and bright pool towels ready to go. The balcony is small but accommodates two chairs and a table. 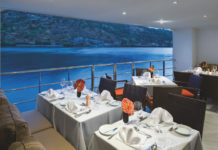 If you want to upgrade, the Haven is a private area on deck 16 with suites, an exclusive restaurant and a thermal courtyard with loungers and a small pool all specifically for Haven guests. Spa suites on deck 14 also have access to the Haven, and to the concierge and 24 hour butler exclusive to these rooms, as well as the relaxing private sun deck. Maybe it’s a reflection of the fact that my travelling companion is 15, but this cruise is much more active and adrenalin-fuelled than any I’ve been on before. I whizz down water slides, dance to the DJ by the pool (this is unlike me – I even do the Macarena, for heaven’s sake) and cry tears of laughter in the Headliners comedy club. A passing gaggle of teenage girls declare Charlie ‘cute’ and he is whisked off to Entourage (the club for 13-17 year olds). After this, I spend increasing amounts of time on my own as he mingles with his new friends, but still I don’t feel alone. Everyone is just so friendly. I have the time to enjoy a very educational New World vs Old World wine tasting session and, chatting to other parents, I gather that the clubs for younger children are just as good. Splash Academy is split into age-related groups: Turtles: 3-5 years, Seals: 6-9 years and Dolphins: 10-12 years. Activities are fun and wide-ranging, from arts and crafts to circus school, with sessions available from 9am through to 10.30pm. There’s also a ‘Guppies Playroom’ for supervised play with babies. Norwegian feature Nick Jr and Nickelodeon on board and character meet-and-greets and events are very popular. It’s not unusual (and oddly thrilling) to bump into SpongeBob SquarePants and his friends around the ship. I take advantage of my child-free time by visiting the huge Mandara Spa. The hydrotherapy courtyard has a sauna, steam room, therapeutic salt room, jacuzzis and a therapy pool. A week’s pass costs $199. 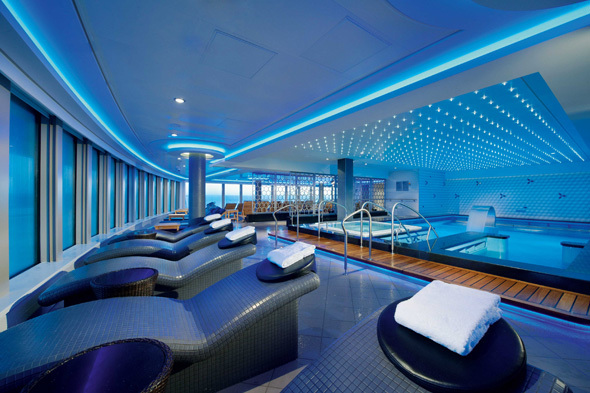 There are incredible views from the front of the ship and clever relaxing heated beds, perfect for reading a magazine and sipping a lemon tea. The spa itself is sparkly and modern, with a hair salon, state of the art Pulse Fitness Center, gorgeous treatment rooms and friendly therapists offering a full range of Elemis treatments. 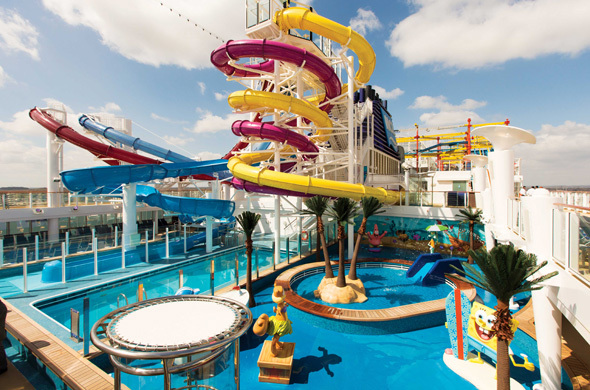 On deck, there are two main pool areas, one inhabited by SpongeBob SquarePants and Patrick Star, with water fountains, a small slide and a larger children’s pool. There’s an adults-only pool surrounded by several jacuzzis. On sunny days, especially on sea days (we had an extra day at sea as sadly the weather was too bad to dock at Norwegian’s private island in the Bahamas, Great Stirrup Cay) the outside decks are very busy and the DJ booms out the tunes by the pool (hence the shameful Macarena incident); but if you prefer a quieter area, there are plenty of places to go, including a secluded sun deck located up a stairway on the forward part of the ship. The water slides are very high and fast and I’m persuaded to climb up to the one where you stand in a small capsule and the crew member (who seems to enjoy his job way too much) shouts “are you ready to play?” before pressing a button which makes the floor suddenly disappear and sends you rocketing down the tube, loop-the-looping over the sunbathers on deck, before depositing you – wet and bewildered – in a chute at the bottom. I still wasn’t sure if I was ready to play and it was all over. Once was enough for me, but on a port day, queues are small. Our stop at Port Canaveral was rainy and after a quick look at Cocoa Beach and the famous Ron Jon’s Surf Shop we headed back to the ship and the teenagers practically had the slides to themselves. Even after the out of character tube whooshing, I still couldn’t be tempted up on to the high ropes course at the very top of the ship, but Charlie loved it, walking the ‘plank’ which juts out eight feet over the side of the ship (it looks terrifying, but is really very safe as they’re attached by harnesses). I leave him to it and go in search of ice cream. That’s the beauty of cruising like a Norwegian right there: eating too much ice cream, mum dancing… it’s all permitted. Encouraged, even. There are 29 different dining options on board Norwegian Breakaway, with everything from ‘serve yourself’ soft ice cream to sushi at Wasabi Sushi (à la carte – priced per menu item) and pizza delivered 24 hours a day to anywhere on the ship for $5. This basically means you can eat around the clock – a concept very appealing to a teenager. Room service is slightly hit and miss, and we found it best to pop to one of the many cafés if we wanted a snack. Complimentary dining experiences include the Garden Café Buffet, serving breakfast, lunch and dinner with a wide range of dining options including pizzas, burgers, pastas, roasts, dessert, cookies, cakes… you name it. It can get very busy, especially at breakfast, but it’s a fast and easy way to dine, popular with families. O’Sheehan’s is an Irish pub and restaurant open 24 hours, and both Taste and Savor offer table service dining. They serve similar menus in a stylish atmosphere and again with Norwegian’s ‘freestyle dining’ ethos, there’s no need to book and no queuing, with plenty of tables available whatever time you visit. The Manhattan Room is a larger restaurant space, with beautiful décor, often with entertainment, and I persuade Charlie to leave the Entourage club for long enough to join me for dinner one evening. It’s slightly more formal: male guests are required to wear long trousers, closed toed shoes, a shirt with a collar, and shorts aren’t allowed. 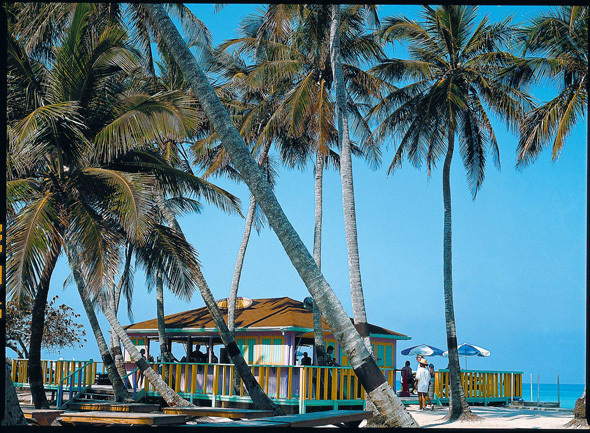 The menu is varied and creative, with great steaks and a good selection of wines by the glass. The delicate macchiato cheesecake won a place in my all-time top ten desserts. And that is certainly not an easy list to crack, let me assure you. If you’re happy to pay a little extra, there is a huge amount of choice of speciality restaurants. Norwegian have teamed up with New York Chef and Iron Chef America star Geoffrey Zakarian to launch Ocean Blue ($49 cover charge), and there is the fabulous Teppanyaki ($25 cover charge), where skilful Japanese Teppanyaki chefs turn dinner into a show. Moderno Churascaria ($20 cover charge) is Charlie’s favourite, a Brazilian steakhouse with ‘gauchos’ who bring course after course of delicious meats to the table on skewers: a tender filet mignon, delicious rosemary scented barbecued lamb… carving it in front of you, until you either explode or turn your Moderno place card to red, meaning ‘no more’. Several of the bars and restaurants, including the very popular French Le Bistro ($20 cover charge) and Italian La Cucina ($15 cover charge) have outside space in The Waterfront, a wonderful place to sip a cocktail and watch the sunset, and prime viewing for the firework display. Entertainment features heavily on a Norwegian cruise and the shows on board are top notch, including Rock of Ages, and Burn the Floor. The highlight for us, though, was the Cirque Dreams dinner show which featured ridiculously talented performers doing things that the human body just shouldn’t be able to do, all in Breakaway’s Spiegel Tent. 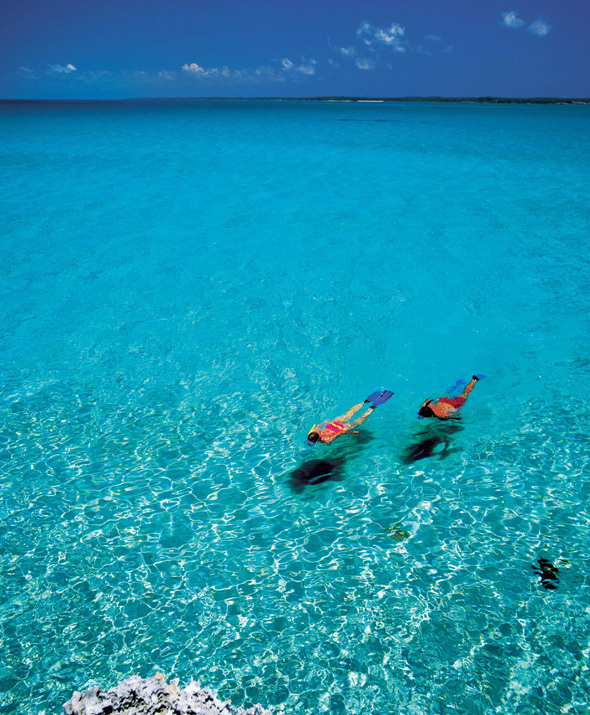 The sun finally appears to welcome us to Nassau, with its stunning beaches. We head to Athol Island on a small boat to snorkel over a reef in warm turquoise water, squeaking through our snorkels as huge, brightly coloured fish swim inches from our masks. A word of warning here, though: snorkelling requires industrial strength sunblock. The full horror of my patchy sunburn only became apparent when we were back in our stateroom and was the source of much teenage hilarity. The shame. Shortly after this, we headed back to New York, ready to catch our supremely comfortable Virgin Atlantic flights back to the UK, relaxed, invigorated, and with some amazing experiences fresh in our minds. If this is how freestyle cruising works, I think we should all start cruising like Norwegians. They obviously know a thing or two about it. 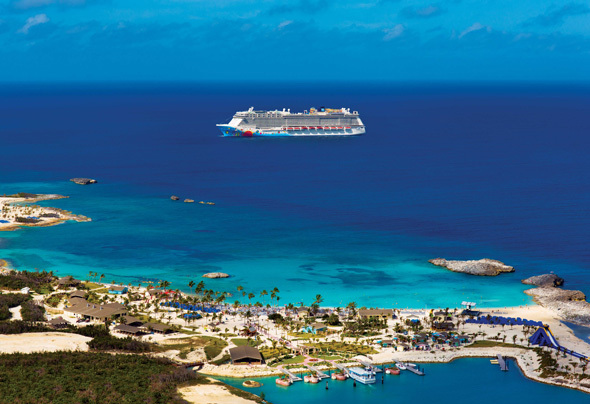 Virgin Holidays Cruises offers an 10-night New York Stay & Bahamas cruise with three nights at the Manhattan NYC (Affinia Hotel) and seven nights on Norwegian Breakaway from £1,39pp. Price includes Virgin Atlantic flights direct to New York from London Heathrow and free all-inclusive drinks package. Offer is subject to availability and includes all taxes and fuel surcharges which are subject to change. To book, go to virginholidayscruises.co.uk, call 0844 488 3084 or visit one of their 130 stores located in Debenhams and House of Fraser nationwide.